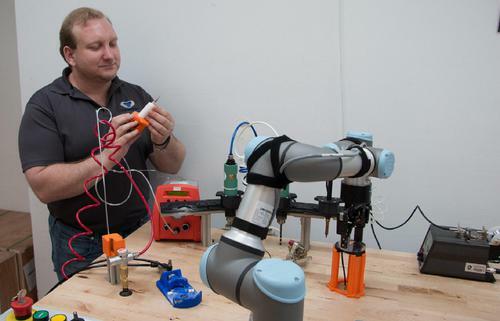 Is ultimate automation inadvertently bringing back the human touch to manufacturing? Conceived at Siemens and formalized by Germany’s Federal Ministry of Education and Research and Federal Ministry for Economic Affairs and Energy, the notion of “Industry 4.0” continues to gain currency around the world. At its core, Industry 4.0 refers to factories that have digitized their physical technologies so plants and equipment can communicate with each other over the internet. The specific technologies vary from industry to industry, but they frequently include networked machinery, control systems, logistics setups, robots, 3D printers and autonomous vehicles. 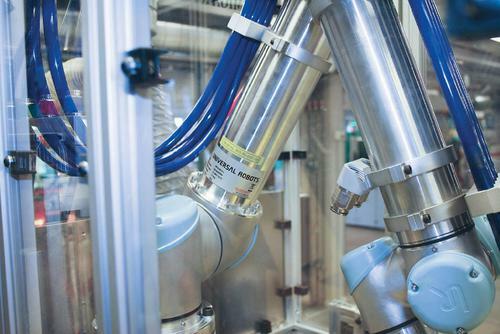 The point of all this interconnectivity is machine-to-machine communication that enables an unprecedented degree of automation and operational independence – hence the “smart factory” moniker often applied to Industry 4.0 environments. British industry will miss out on an enormous potential if manufacturers continue to stick with outdated ways of thinking about humans versus machines. The future belongs to companies that are capable of thinking about humans working together with machines. Since the start of industrialization, humans have functioned as if they were machine parts in the production facilities, carrying out trivial, debilitating, boring work. Like human robots. Industrialization’s DNA has been efficiency, consistency, reliability and precision – as the machine and the production facilities that people were compared with. An assessment of humans versus machines: Who was best, quickest, most precise and persistent? Danish fabricator - MVI Maskinfabrik- originally specialised in small batch production with short lead times but wanted to increase manufacturing flexibility to introduce new products; a new range of fittings for kitchen manufacturers, the wholesale market and general engineering applications. The company was also starting to receive larger orders and management was faced with the decision whether to increase manpower to service them. 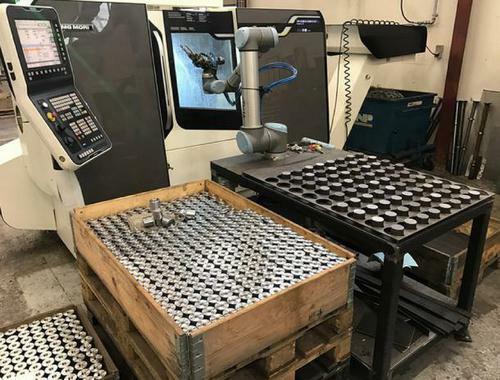 Investment in a collaborative robot from Universal Robots (UR) proved to the be perfect solution for this small business. It instantly provided the increased capacity and flexibility the company needed and, more specifically, resulted in welding time being cut by 50%. 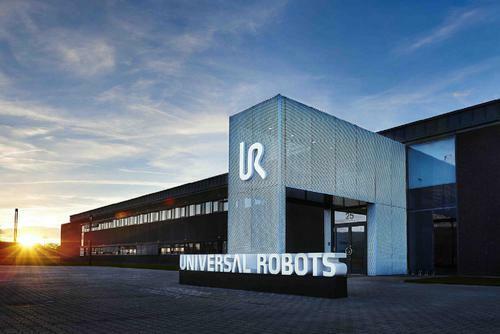 Universal Robots, the pioneer and market leader of collaborative robots, introduced the online learning platform, Universal Robots Academy, to ensure that everybody with a desire to learn the concepts of cobots gets the introduction necessary to master basic programming skills. 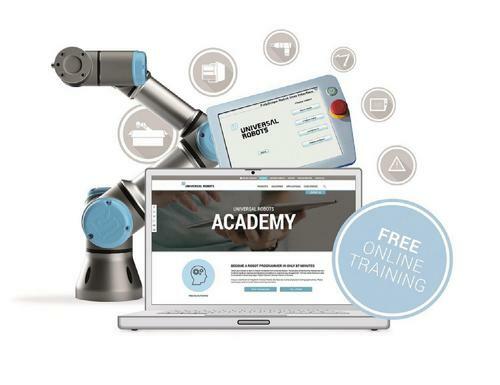 The company is now expanding the online training, adding three new modules that step up complexity by teaching users how to create and work with coordinate systems, variables and conditional statements, and how to use the robot's wizard to easily create a program for packaging. Sure, cobots are lightweight: the largest UR10 robot is under 29 kg/64 lbs, so they're easy to pick up and move from one process to another. But they're no lightweights when it comes to heavy-duty processes like welding. 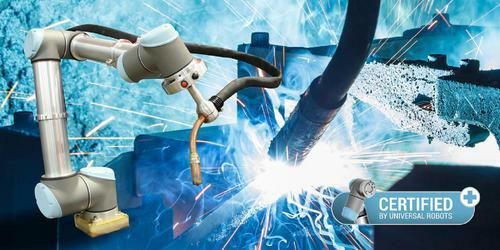 In fact, there's already a range of cobot welding systems to choose from. Surprised? Don't be. It's just one more smart application for these flexible, cost-effective, and easy-to-program automation tools. The flexibility and ease-of-programming of cobot-based welding systems make them especially well-suited for low-volume/high-mix environments, as well as custom or small-template welding processes. But with high accuracy and repeatability, these systems can also handle long runs with consistent quality. Welding tasks can be programmed in as little as half-an-hour by workers who have no previous experience, and programs can be saved and reused, saving the expense of trained robot programmers. 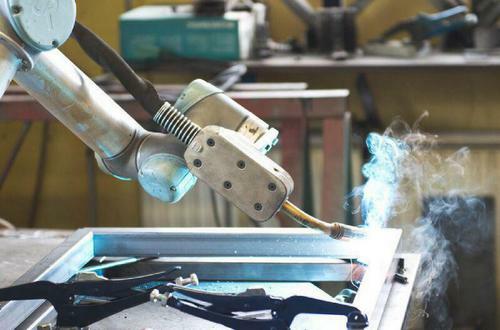 Lightweight cobot welders can be mounted on tabletops, hung from ceilings, or installed into existing welding booths, offering more flexibility than manual welders or traditional fixed robots. Several companies have already announced cobot welding systems. If you're thinking about automating and you're not sure where to start, here is a quick guide for your first steps towards automating your manufacturing processes. Having worked in industry for 10 years, Jesper Larsen decided to go it alone. In April 2016, he set up Vivo Production, invested in two CNC machines and single-handedly established a very successful subcontracting business. Output ranged from batch production through to prototypes, typically for the wind power and offshore industries. As his reputation grew, so did his order intake. Jesper Larsen began to struggle keeping pace with demand. The purchase of another CNC machine was already planned so he wanted to avoid the cost of bringing more people into the business, at least in the short term. The helping-hand he chose instead was a Universal Robot UR10. Hearing aid device manufacturer Oticon required a more flexible robot to handle the tiny hearing device components in its production. 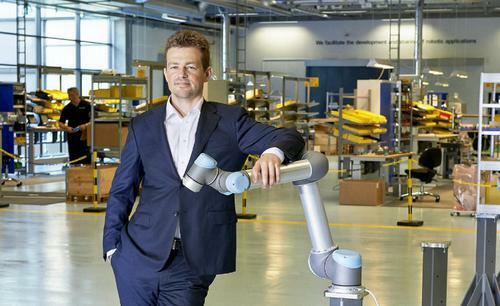 The company had been using robot technology for the past 10 years. But, as the minute components became increasingly smaller in order to make the hearing aids more comfortable, the existing two- and three-axes robots used in manufacturing were no longer suitable. They could not perform the required lateral and vertical movements sufficiently. If for instance a small part is stuck in a mould, the robot should be dexterous enough to tip it out. Intuitive user guidance and the precision of the Universal Robots, were the features that convinced Oticon. Also, rapid advances in medical engineering have resulted in constantly changing production processes and a broader range of hearing aid models that require a flexible robot handling smaller batch sizes. Small components such as wax filters are barely a millimetre in size. A touch of the 22mm EMAS Class. EMAS are proud to announce the introduction of an Industrial 22mm standard capacitive touch “button”. 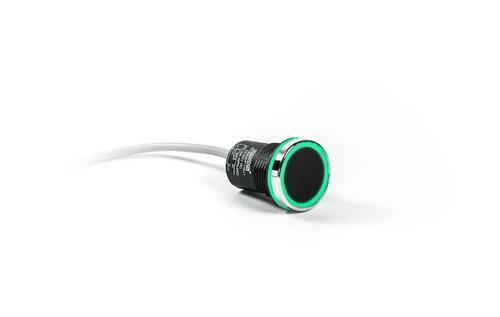 This innovative touch “button” when powered, is illuminated by a Green led ring highlighting the button , and shows positive operation by changing colour to red when the output is operational. At this year’s Drive’s & Controls Exhibition in the Smart Industry Expo, Festo, the leading supplier of automation equipment, will be showcasing exciting new developments and solutions for smarter automation. In modern machine concepts 4.0, hardware modularity, as well as modularity for engineering, is in demand to enable machines to be flexibly modified for adaptive production processes. The object-oriented automation software LASAL supports mechatronic engineering. In the extensive library, modules for various standard functions are provided. With LASAL Add-Ons, the user can create application software even quicker and easier. The ready-to-use templates are constructed like wizards and available for diverse machine functions. For example, the control of a Delta robot and corresponding visualization can be quickly and easily created only with a few mouse clicks. Further examples include templates for CNC, axis control, Pick&Place, OPC UA, VNC, temperature control, PID controller, user management, diagnostics, data analyzer and recipe management. The Add-Ons are configured function-specifically and contain all the necessary program and display elements in different resolutions. A brief description and thorough documentation of the respective features are integrated. The templates are designed for multi-CPU solutions and can also be simply added to existing projects. An additional benefit of object-oriented programming with LASAL is that once software classes have been tested, they can always be reused and comfortably adapted. This can reduce software engineering by up to 70 percent – with increased quality and greater clarity. 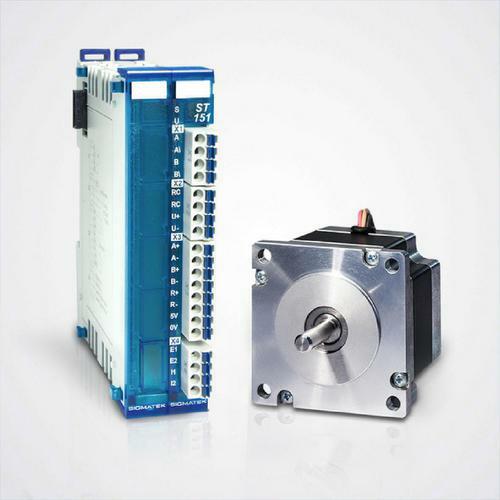 The ST 151 expands the S-DIAS Motion series with a high-performance stepper motor output stage, which is designed to control two-phase stepper motors up to a rated voltage of 50 V DC and a continuous current of 5 A in full and half step mode. In addition, microstepping is supported with 64 micro steps per full step, whereby a highly precise and at the same time smooth running of the motor is achieved. The wireless handheld panel HGW 1033 pulls out all the stops in operating comfort. First, through wireless data transfer, the meter-long cables in the production hall have been eliminated. 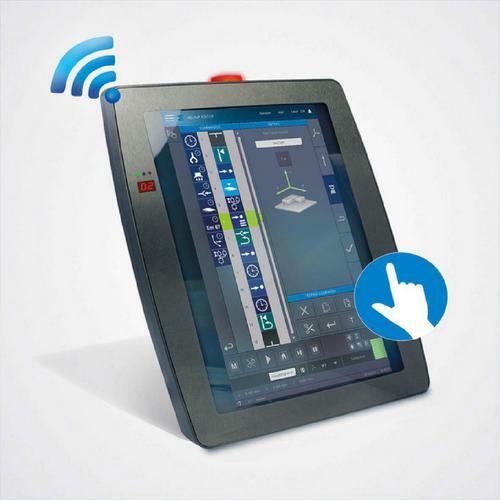 Second, the mobile panel has a 10.1-inch multi-touch display (PCT) that is suitable for industrial applications and offers a wide range of visualization options and an intuitive operating concept. London, England (22 September, 2016) – Panduit, the world-class developer and provider of physical infrastructure solutions, is releasing pre-configured and factory assembled micro data centers (MDC). The MDC includes all connectivity and cable management components necessary to enable rapid installation of switch, server, and storage devices. Available in 24 RU and 42 RU cabinet configurations and offering enough room for growth without increasing the control room footprint, the MDC allows for installation of standard 29-inch (737mm) depth equipment. Each MDC incorporates casters to simplify deployment and is easily expanded by purchasing add-on kits from Panduit. All metal elements within the cabinet are single-point bonded to ensure effective equipment grounding. A dynamic rated MDC is available to support IT equipment under typical shipping conditions. This is ideal for system integrators or Value Added Resellers (VARs), as it allows the equipment to be pre-installed, cabled and ready for quick deployment. The heavy-duty reinforced frame and shock pallet have been tested and approved to support the additional weight of equipment and a re-useable ramp allows the cabinet to be easily unloaded from the pallet. All MDCs meet EIA-310-E, TIA/EIA-942 and UL2416 specifications. For more information on Panduit’s MDCs, visit www.panduit.com/mdc. Assess, design, deploy and manage a network infrastructure built around IT and OT physical layer standards that assures fast, repeatable installations with Panduit Industrial Automation Infrastructure solutions.